A team of researchers from Ludong University compared the susceptibility of different triangle silver nanoprisms (TSNPRs) towards H2O2 and elucidated the influence of capping agents and structural size on the etching process, with the aim of optimizing TSNPRs for H2O2 etching-based biosensors, such as glucose and glucose oxidase. The result of their research was recently published in a paper in NANO. As a characteristic two-dimensional plasmonic nanostructure, triangular silver nanoprisms (TSNPRs) possess an extreme degree of anisotropy since their lateral dimension is larger than the thickness, giving highly sensitive surface plasmon resonance (SPR) responses. Many strategies have been developed for the biosensors based on target analytes induced morphologies changes and plasmonic peak shifts. A typical approach is to etch TSNPRs by an oxidative hydrogen peroxide, also known as catalytic product of glucose oxidase (GOx). Relative TSNPRs etching-based plasmonic biosensors have been used for detecting glucose, antigen and DNA. However, synthesis of TSNPRs with well-defined tips needs the assistance of appropriate capping ligands, such as citrate, polyvinylpyrrolidone (PVP) and so on. To date, there has not been a systematic study on the influences of the capping agents on H2O2 etching of TSNPRs. Besides, the analysis of structural size could also provide valuable information since size parameter is essential for the efficacy and performance of TSNPRs for sensing and detection. The team of researchers from the School of Life Sciences at Ludong University performed a study to compare the susceptibility of different TSNPRs towards H2O2 and elucidated the influence of capping agents and structural size on the etching process, aiming to optimize TSNPRs for glucose oxidase etching-based biosensor. Detail analysis revealed that the small sized TSNPRs capping with citrate alone have been expected to be of great interest in the trace of glucose and glucose oxidase. This research work appears in the latest issue of the journal NANO. This work performs systematic studies on nanoprisms for glucose oxidase etching-based biosensor. Nanoprisms with a small size and citrate capping were served as a substitute for big nanoprisms to sense glucose, offering a number of advantages such as high sensitivity, improved calibration, time-saving and extend detection ranges. and These sensing assays have been expected to be of great interest in the trace of glucose, providing an ultrahigh sensitive glucose etching-based analytical platform for point-of-care diagnostics of diabetics. 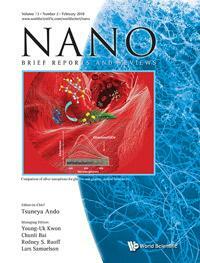 For more insight into the research described, readers are invited to access the paper in NANO's January issue.